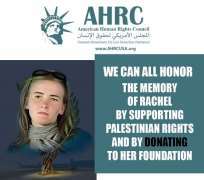 The American Human Rights Council (AHRC-USA) joins the Corrie family and all other peace loving people across the world in commemorating the death of human rights activist Ms. Rachel Corrie. Rachel, like so many other peace activists, lost her life standing up for the human rights of others. In doing so, she affirmed her own humanity. Rachel Corrie was a 23-year-old American peace activist who was crushed to death by an Israeli bulldozer on 16 March 2003. At the time she was killed she was trying to peacefully block the Israeli authorities from illegally demolishing a Palestinian home in the Occupied Palestinian Territories. Since her brutal killing, the Corrie family, as well as Rachel's friends and supporters, have devoted their time, energy and efforts to keep Rachel's legacy of fighting for justice alive. More than 15 years after the death of American hero Rachel Corrie, still no justice for Corrie. In an email to her mother sent on February 28, 2003 Rachel wrote: "I should at least mention that I am also discovering a degree of strength and of basic ability for humans to remain human in the direst of circumstances - which I also haven't seen before. I think the word is dignity. I wish you could meet these people. Maybe, hopefully, someday you will." "The Palestinian struggle is a struggle for human rights and justice that appeals to all supporters of human rights around the world," said Imad Hamad, AHRC Executive Director. "We are all indebted to the heroes who risk their lives and limbs to stand up for the human rights of others," added Hamad. "We can all honor the memory of Rachel by supporting Palestinian rights and by donating to her Foundation," concluded Hamad.